They were Communists. Not liberals or progressives. They wanted the Russians to win the Cold War, and the Vietcong to defeat America in Vietnam. They didn’t even like liberals. The radicals of the 1960s were Communists. And today they continue to lie about it. 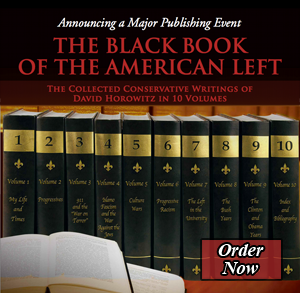 That’s the major takeaway from The Black Book of the American Left, a new book by David Horowitz. Horowitz, the son of two American Communists — with a capital C, meaning party members — was a radical student leader and the editor of Ramparts magazine in the 1960s and early 1970s. He began to turn politically in 1974, when he sent his friend Betty Van Patter to help the Black Panther Party only to have her turn up murdered soon after. For Horowitz it’s caused a crisis, then a conversion to conservatism. Horowitz has been a well-known conservative activist for decades, but it’s quite bracing to have a lot of his internet writings compiled into one hardback volume. And again and again in The Black Book of the American Left, he hits his main point: the “activists” of the 1960s, like the “progressives” of earlier eras, were Communists. They wanted to topple the government of the United States. Bill Ayers and the Weather Underground were not interested in mainstream Democrats like Hubert Humphrey or any liberal solution to any of America’s problems. They wanted to blow things, and people, up. They wanted a revolution. I would argue that there is an important difference between the radicals of the early 20th century and those of the 1960s and today, and that Horowitz doesn’t capture this, but I’ll get to that shortly. For now it’s worthwhile just to sit back and listen while Horowitz, a compelling writer and honorable man, remind us that the people he rioted with in the 1960s were, yes, Communists. Tom Hayden. Angela Davis. Bill Ayers. Noam Chomsky. Todd Gitlin. The Black Panthers. Students for a Democratic Society (SDS). Mary Travers of Peter, Paul and Mary. The Weathermen. Reds, all. Some more violent than others, but all of them called for a revolution. Ask yourself: why did left-wing demonstrators attack the 1968 Democratic convention in Chicago? It wasn’t because they hated Republicans, although that was also true. They hated liberals because liberals at the time represented authority in America. Student radical Todd Gitlin, who now, like so many of his left-wing friends, is a professor, didn’t vote in 1964, even though Barry Goldwater was against the war in Vietnam, which was supposedly Gitlin’s top issue. So why didn’t Gitlin vote for Goldwater? In later years Gitlin would give a weak excuse, but the answer is obvious: he was a left-wing revolutionary who wanted to collapse the American system of government. These people were in no way, as Horowitz puts it, “mooning for Robert Kennedy and Martin Luther King,” as they would later claim. They wanted to bring the war home, and topple the United States. Horowitz connects the left of the 1930s and 1960s with the left of today. This is accurate as far as a lot of academics go, but I think that is different than the modern left in the media and popular culture. As historians such as Christopher Lasch and James Hitchcock have observed, there has been not just a political but psychological transformation in the United States over the last 40 or 50 years. Once communist radicals like Whittaker Chambers and the editors of The Nation believed in communism as a kind of mathematical religion; there were going to occur certain things as history marched towards its resolution, and the role of the revolutionary was to aid in that process. But this meant that when that system broke down, there was the chance that reason could break through the cracks. Horowitz’s own Communist parents saw their worldview collapse in 1956 when Soviet leader Nikita Kruschchev made a speech denouncing the crimes of Stalin and the “cult of personality” that surrounded Stalin. Whittaker Chambers, as he chillingly put it, “heard the screams” and saw the lie that was communism.